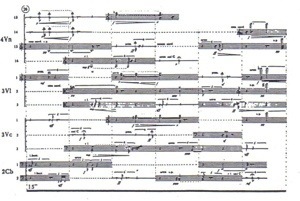 Krzysztof Penderecki’s ‘Threnody to the Victims of Hiroshima’ was an experiment in extended techniques for string instruments and the use of tone clusters written in unconventional musical notation using specialized symbols for the extended techniques and marking time in seconds rather than a tempo and metric divisions. It is scored for 52 solo strings which play sounds, not melodies for the indicated durations in the score. It was written in 1959 and was originally titled, ‘8’ 37″‘ perhaps a reference to John Cage’s ‘4’ 33″‘ of 1952. The composer had just won prizes for three works (Strophen, Psalms of David and Emanations) at the Warsaw Autumn Festival earlier that year. The Threnody effectively launched his career as a composer. 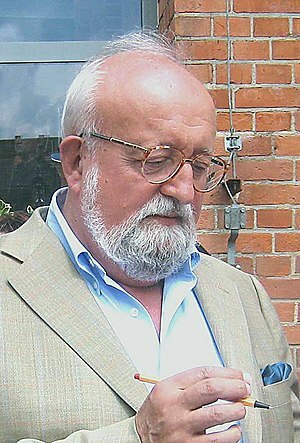 Penderecki states that he simply changed his mind about the title and decided to dedicate it as “Threnody for the Victims of Hiroshima”, a title which was certainly topical in the Cold War paranoia of the times about nuclear holocaust. 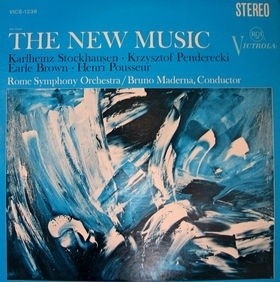 It is under that title that the piece has received numerous performances and recordings. It was used briefly in the film, ‘The Lives of Men’. Penderecki’s music has been used in films such as ‘The Exorcist’ (which first introduced me to this composer), ‘The Shining’ and ‘Shutter Island’ among others. But the sound world or sonic signature of his work has been very influential. He has not been largely political in his musical output but the ‘Lacrimosa’ (1980 later incorporated into the ‘Polish Requiem’, 1980-2005) was commissioned in commemoration of the Solidarity struggles which signaled the end of communist rule in Poland. His composition, ‘Dies Irae’ (1967) has been subtitled the ‘Auschwitz Oratorio’ and is dedicated to the victims of the infamous Nazi death camp.